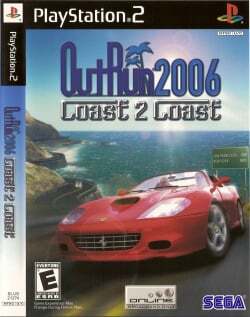 Game description: OutRun 2006: Coast to Coast features a choice of 15 fully licensed Ferrari models, featuring the all-new F430 and F430 Spider, as well as the dazzling Superamerica and the stunning 550 Barchetta. Power your way across 15 new American themed environments from the "OutRun2 SP" arcade experience. Race from coast to glorious coast with a fresh new mission structure, a license mode and online play, with up to 6 players for a thrilling head-to-head journey. Outrun 2006 is a re-imagining of the first game in the series, and has a completely new game engine and modern graphics. The game is split into two parts: A faithful conversion of OutRun 2 SP (which itself includes the OutRun 2 levels), and "Coast 2 Coast", which includes single-player races and challenges, and local network and Internet multiplayer. This page was last edited on 24 February 2019, at 04:10.